Outside-Inns was created to bring a high quality bar experience to the outdoor events industry. We design and build real wooden bars, which can either be located in a marquee or any other large structure. We always offer a wide choice of real ales, which we dispense through traditional hand pumps. Our inflatable cellars ensure beers are always served at the perfect temperature. We offer a wide range of UK craft produced ales, lagers and ciders and internationally sourced wines and spirits but can easily adapt our drinks portfolio to suit your sponsorship arrangements. We have a team of core staff we take with us around the country and compliment this experienced team with local staff as required. We always invest time and training in our event staff to get the best from them and ensure they exceed the standards of customer service we pride ourselves on. 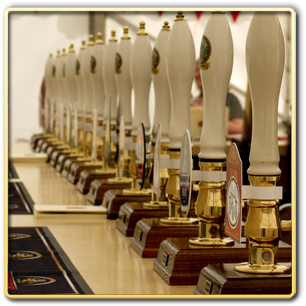 We have particular expertise in providing high volume "real" cask-conditioned beers and we can provide everything needed for an unforgettable beer festival. We always use traditional hand pumps to dispense the beer and our refrigerated inflatable cellars ensure beer is dispensed at the perfect temperature – even in mid-summer! We can chill, condition and dispense 12,000 pints of beer a day if needed and, equally importantly, do it again the following day, and again and…. well, you get the idea! We can provide you with a beer festival within a larger event or help you create a beer festival from scratch, particularly if you have an interesting location in which to host a new event. i.e. a museum, historic building etc. 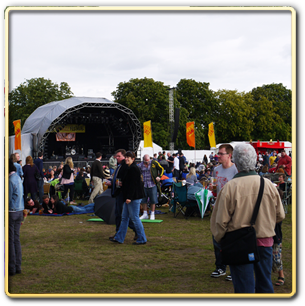 We are equally happy to work as contractors to larger events or create our own events from scratch using your location. 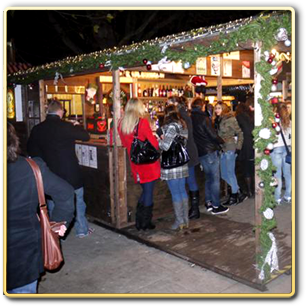 When we decided to put one of our bars into the Cologne Christmas Market on The Southbank in London we know we had to go about producing the perfect beer cabin or "Outside-Inn" as it became known. The design went through 9 changes until we were finally happy with the look and layout of the Inn and we were delighted with the end product when it was assembled. 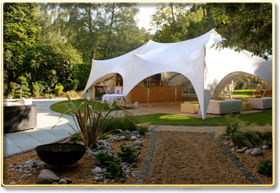 An Outside-Inn is perfect for a longer term placement as they provide a more secure and self-contained structure and are much more appealing to look at than a marquee. If you would like to discuss an "Outside-Inn" placement for the summer or winter months please get in touch. The wooden inns can be tailor made to suit specific locations with a minimum requirement of 6 metres deep x 4 metres wide. If you are looking for a premium quality and bespoke bar experience for your guests you have come to the right place. Whether you want champagne and cocktails or a mini beer festival we can provide your function with everything you need to make the party happen. Our real wooden bars will provide your guests with a fantastic backdrop inside your party marquee and our expert and knowledgeable staff will look after your guests as if you were serving them yourself.